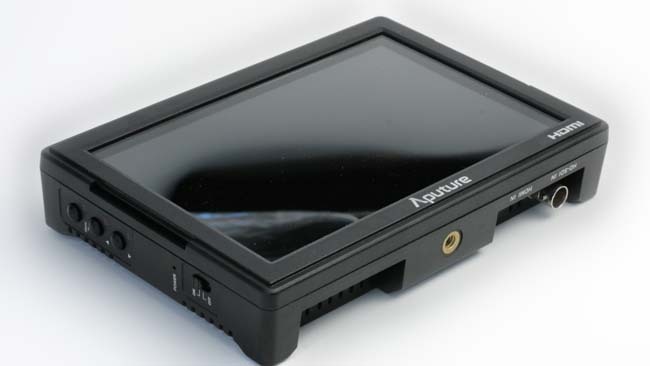 The Aputure VS-5 is a 7” monitor that’s designed to solve that problem. How well does it do? First off, any many have noted it’s packed with professional tools like Zebras, Vectorscope, Peaking, Histogram, Monochrome, Waveform, and False Colors. The 1920 x1200 HD display is beautifully sharp for a 7-inch screen. And it’s plenty bright to my eye. It has both HDMI and SDI inputs, making it functional for professional cameras. Aputure is known for being customer centric, and they don’t disappoint here. They provide everything you need to maximize your experience: sun hood, carry bag, and a variety of cords. Everything except batteries, which I find a bit odd. But! it uses the omnipresent Sony NP-F/FM/QM Series type batteries, so they’re cheap and you may have a few of them lying around anyway. I did. The unit is surrounded by vents around the side, and I was surprised to find it gets a little warm. Not hot, mind you, so it’s not a problem-- but warm. The menus are easy to use and navigate. The unit feels reasonably sturdy. For all those pluses, there are some drawbacks and considerations. While some of the tools-- Zebras, Peaking, and Histogram-- I find to be incredibly useful in the field; others like Vectorscope and Waveform are tools I traditionally use in post. The way I shoot, I don’t expect to use those two in the field. It takes a very controlled environment to adjust for waveforms. Because I shoot with a Sony A7sii which has zebras, peaking, and histogram functions built in, my monitor is most useful for seeing the big picture and sharing with the producer. In other words, the "non-professional" tools. The Aputure doesn’t have built-in LUTs for SLOG, so if that’s something you rely on you’ll be frustrated. Even worse, SLOG footage becomes unsuitable for the producer’s eyes. The unit also suffers from a slight lag. It’s more of an occasional distraction than debilitation, so some folks may not be bothered by it. As always, the answer to that question has a lot to do with how you shoot. For $500, the Aputure has a lot of professional features and is well-built and well-designed. If you want those features it's a great unit and a bargain. I like that it provides a well-designed sunscreen... one of those equipment bits that are frustratingly expensive when bought separately. If you shoot in less controlled environments however-- weddings, events, or just in situations where there isn’t a lot of time (which is typically the case for me)-- you probably won’t use those features. And your camera may already have them built in. It’s definitely an investment, and to me it feels like the VS5 falls uncomfortably between a $200 budget monitor and a $1200 monitor/recorder that also give you better footage (rather than better viewing). I’m not sold on it, but that doesn’t mean it’s not right for some people.